If you're a fan of Asian cuisine, you'll know that stir-fried foods is extremely popular and delicious. However, in order to properly use a wok, you need an hot heat source that can accommodate the round bottom of most traditional style woks. If you've been struggling keeping your wok on your stove, fear not! We found some of the best wok rings on the market that will keep your wok stable while you cook! 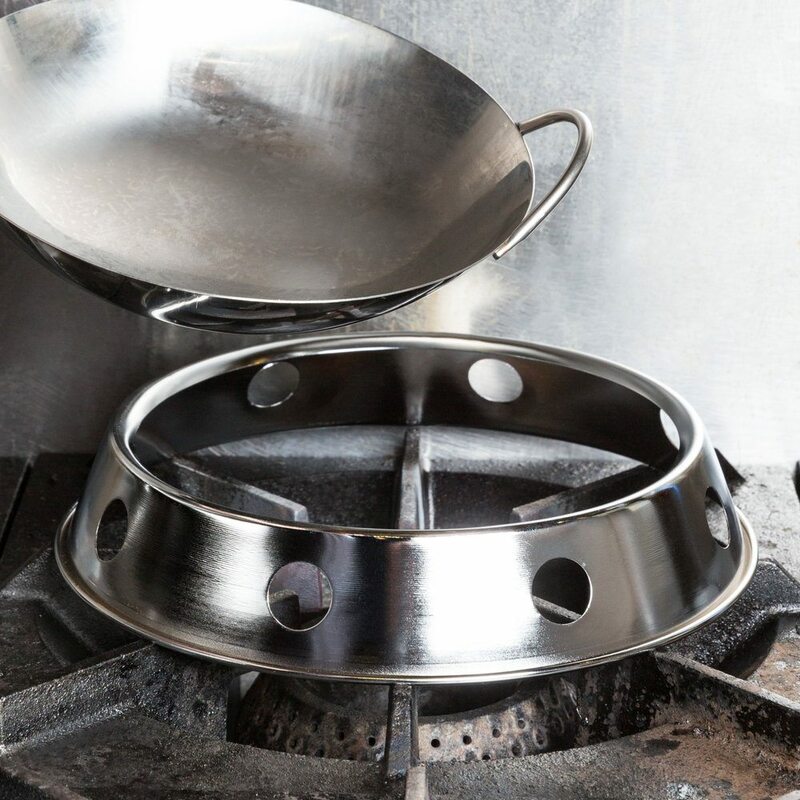 Wok rings, aka "wok stand" or "wok stand ring", are metal rings designed to keep your round-bottomed woks in place while cooking over a stove or grill. These handy rings are made from all types of metals and range in shape and size. Also, wok rings can help keep heat more concentrated in on area, depending on the style of cooking. Most of the time, wok rings are used over gas burners or outdoor wok burners. Because stoves come in different shapes and styles, wok rings, too, come in various configurations. Generally, these rings are made from metals such as stainless steel, carbon steel, cast iron, and wire. Wire wok rings work well as a multi-functioning wok holder. These are generally made for specifically sized woks. Also, you can use these to hold up dinner plate or serving platters. Steel wok rings are the most popular style of wok ring. These are great for keeping your heat source concentrated. However, this may or may not be advantageous depending on what you're trying to cook. If you need more heat, be sure to get a steel wok ring with holes. Cast iron wok rings are usually an extra piece that sits within the stove top burner. Usually this is an extension that you can replace your burner with so your wok is stabilized. This does not sit on top of your burner; it is placed in it. Gas stoves, by far, are the best heat sources for wok rings. When using a gas stove, the heat from the open flame allows you to cook at higher temperatures. If the wok is elevated on a wok ring, the heat source needs to be higher so it can reach the food in the wok. Also, a gas burner can allow heat to be concentrated, but sometimes it can get a little too hot. That's why the main function for these rings is for stability. Alas, these common stove top styles are quite tricky to work with wok cooking. Many debate whether or not it really is possible to cook with a wok on these heat sources. 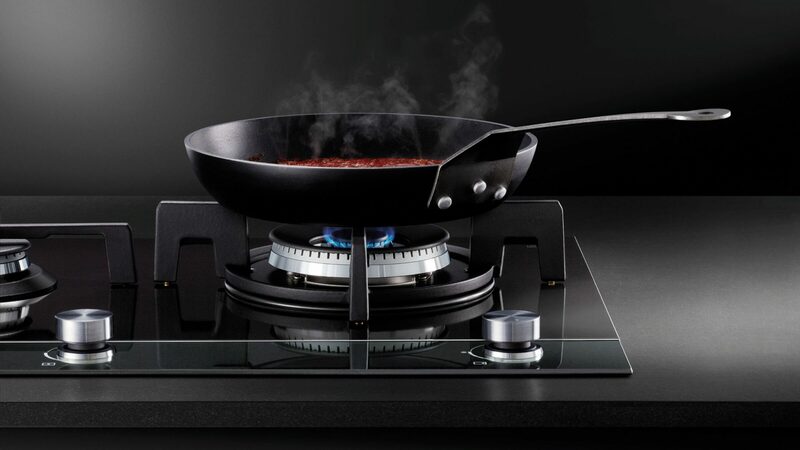 With an induction stove top, you can ideally work with a wok ring without damaging the stove top. However, since the induction stove won't be able to reach as high heats as a gas range, it's not recommended. Here's the tip: if you're planning to cook with a wok that does NOT require high heats on a flat top stove, by all means, use a FLAT bottom wok. It really isn't worth trying to use a wok ring that could potentially damage and scrape your flat stove top just to make a round-bottom wok work. Need the perfect wire wok frame? This is the best bang for your buck. This sturdy wire frame keeps your wok stable when cooking some of your favorite Asian cuisines. Made from strong chrome wire, this frame doubles as a wok ring when cooking and also a trivet to cradle your wok. Also, the wok ring is reversible. The diameters are 8" on the top and 10" on the bottom. Overall, this wire wok ring gets the job done when cooking with your round bottom wok. We highly recommend this product for quality on a budget. If you want a product backed by a winning brand name in cuisine, this is the wire wok ring for you. Joyce Chen's chrome steel wire wok ring is one of the best on the market. This wok ring has a diameter of 10" and 8" while standing 2" high. Also, you can reverse the wok frame to use is at as a trivet. The chrome steel is extra sturdy and durable. If you want a sturdy cooking experience, this is a must have. In the end, Joyce Chen backs up her products with 45 years in the business. You will definitely be pleased with the efficacy and quality of this wok ring. Looking for that perfect steel wok ring flare without the double down dollar sign price? Search no further, this is the perfect wok ring for you. With a diameter of 8 1/4" and 9 7/8" at the base, this is great for wok that are around 12-13" inches. Generally, the rule of thumb is wok rings should be at least 4 inches smaller than the diameter of the wok. Also, this wok ring has holes that allow heat to be distributed more evenly while cooking. In the end, we know you and your family will love what this wok ring can do for your cooking! Need the perfect wok ring that will fit your Asian cooking needs? You will LOVE this wok ring made by New Star International. This 7¾-Inch and 9¾-Inch Cold Forged Plated Steel Wok Rack is a vital piece of cookware for any Asian style cooking. Also, the innovative design has no sharp edges, keeping your finger free of cuts. Plus, this product is made in Taiwan and is of the highest quality. All in all, this is a great wok ring to add to your kitchen arsenal. Once you start cooking Asian cuisine with this wok ring, you won't go back to the old way! As you may have experienced, round bottom woks are very difficult to handle. That's why this stainless steel wok ring by For The Chef will be your new go to tool in the kitchen. The wok ring stand elevates the wok and acts as a heat trap to focus the heat on the bottom of the wok. Utilize the wok ring stand as a serving piece to support the wok and protect countertops or tabletops from potential heat damage. By far, this is one of the best stainless steel wok rings on the market because of its high quality, durable construction, and efficacy when cooking with a round-bottom wok. If you're looking for a wok right that's easy to use and wash, this is the product for you. Most wok rings require you to hand wash them. However, the stainless steel construction allows you to safely wash these in the dishwasher. Not only is stainless steel awesome for washing, it also lasts longer than other metals. Plus, stainless steel keeps heat concentrated so you get more heat on your wok than losing it to the atmosphere. Also, this wok ring comes with holes to evenly distribute the heat during cooking. So, save yourself valuable time by getting this stainless steel wok ring! For those of you who are venturing into commercial Asian cooking, you're going to want this wok stand. Coming in at 9.5" diameter, this wok stand is perfect for woks around 13-14" diameter. Since this stand is made from heavy duty carbon steel, it can hold heavier weights and more food. Plus, there are two rows of holes, triangular ones at the top and circular ones at the bottom. These holes allow even distribution of heat when cooking. In the end, this is the perfect wok stand if you're cooking large amounts. If you're looking to up your game from at home cook to commercial style chef, this is the wok stand for you. This super sturdy stainless steel wok stand can fit woks up to 18" diameter. This means you can cook a MASSIVE amount of food at once, if you got the arm strength. Made from sturdy stainless steel, this is easy to clean and will last a lifetime in the kitchen. Plus, the holes engraved in the stand are extra wide allowing more heat to distribute in extra large woks. All in all, you're definitely going to want to use this commercial wok stand for your business. For those of you who own a Bosch stove, this is the cast iron wok ring for you. Fortunately, this wok ring fits perfectly and snuggly in Bosch gas and duel-fuel slide in ranges. The Bosch HEZ298102 accessory wok ring is compatible with select Bosch gas and dual-fuel slide-in ranges. The wok ring attaches to grates for convenient use, and the cast-iron material provides rugged durability. In the end, if you have a Bosch appliance, this is your best bet! Need a quality product that will last you a lifetime? This cast iron universal wok ring is the product you don't want to miss. With a outer ring diameter of 17.6cm and an inner ring diameter of 16cm, this is a great sized wok ring that fits most household wok sizes. Built from uber sturdy cast iron, this wok ring will surely last you a lifetime. Also, you an use this product in the oven, on the stove, over the grill and even on barbecues and campfires! Finally, no more woks tipping over on the stove top! All in all, you will not be able to cook without this wok ring after one use!